"I don't have to tell you I love you. I fed you pancakes"
I still remember when I first arrived in Canada and saw the IHOP sign and wondered what it stood for? 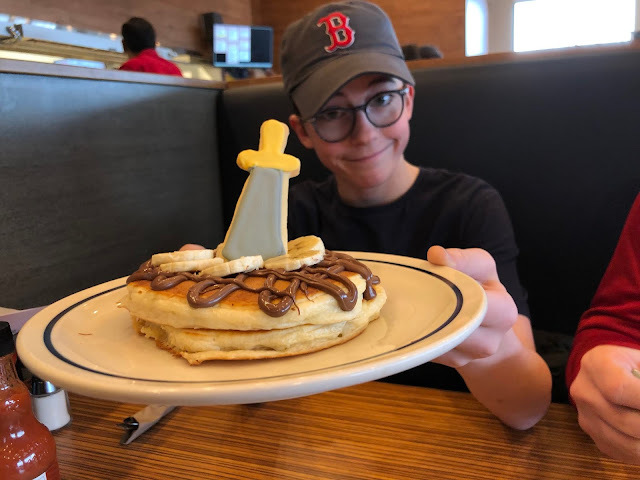 When I discovered it was an actual, house of pancakes, I knew we would be friends. A fluffy stack of delicious pancakes, topped with a perfect pat of butter and drenched in syrup, yep, that holds a very special place in my heart and always will. Me and the family crew were invited to IHOP to check out their brand new App: Pancake Squad and to test out some of the new menu items in conjunction with the movie: "The Kid Who Would Be King"
King of Pancakes: two of IHOP’s world-famous Buttermilk pancakes covered with delicious chocolate and hazelnut sauce and banana slices and an edible cookie in the shape of the sword Excalibur. 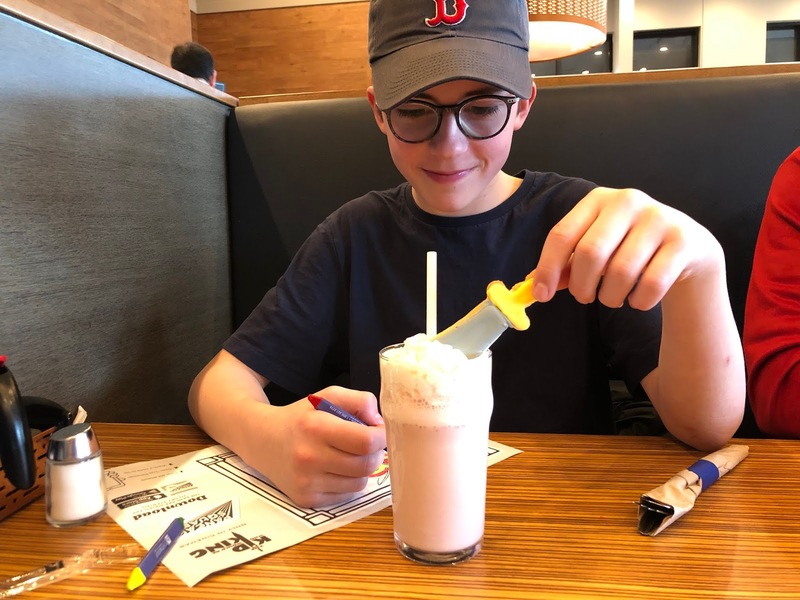 Merlin’s Milkshake: a delicious strawberry or chocolate milkshake topped with whipped cream and an edible Excalibur sword. 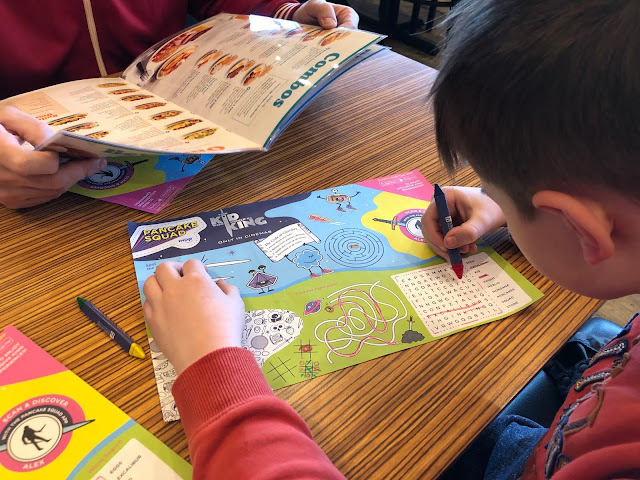 While enjoying these special items, families can use their Pancake Squad App on a mobile device to reveal augmented reality characters and images from the film who magically will appear on their special place mats and at various points in the restaurant such as the “How Many Pancakes Tall Are You” measuring chart. They can also play games including a “photo booth”, a “Kings Quest” and a “Seek & Find” game, all of which incorporate characters and elements from the film. The App is a great! There are a few games and some really cool features that allow you to colour the menu page and bring it to life in the App showing the actual colouring in you have done. 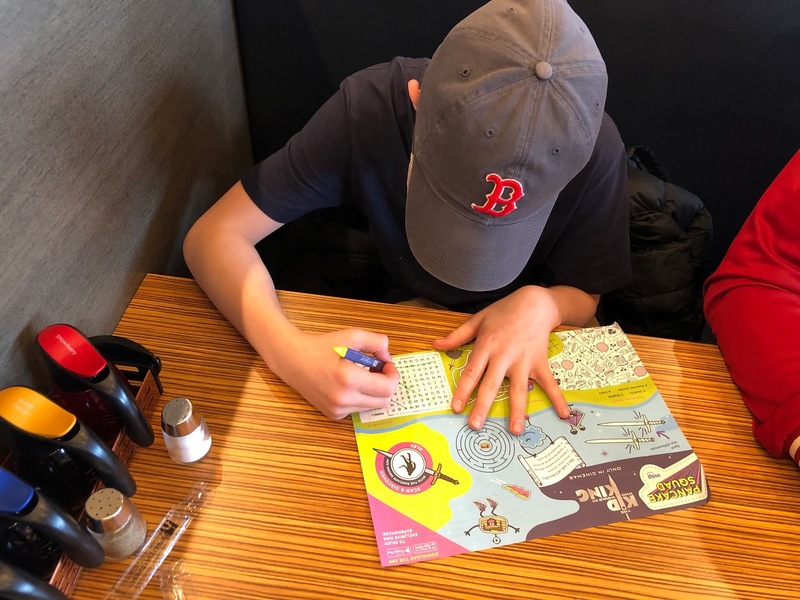 This obviously turned into a family table colouring competition! Great fun! The App is totally free and is fun for kids and grown ups too! You can also use the App to see how many pancakes you are tall, who doesn't need that? Grab the family and go order the largest stack of pancakes you can and say a big Happy Birthday to IHOP who celebrates their 50th Birthday this year! To help spread the pancake love I have a $20 Voucher for IHOP to giveaway. Tell me your favourite pancake combination in the comments and I will pick a winner on 8th February 2019. 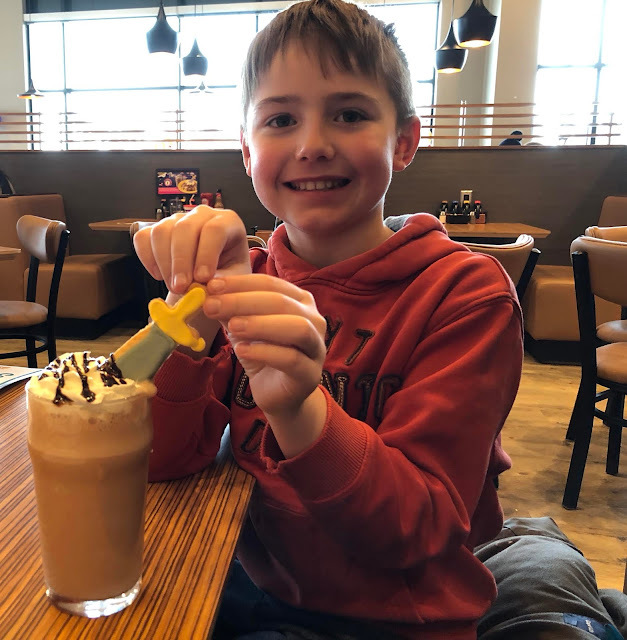 The IHOP's "The Kid Who Would Be King" promotion will be running in participating restaurants until 24th February 2019. Me and my family attended a free press launch event at IHOP. I did not get paid for this post. 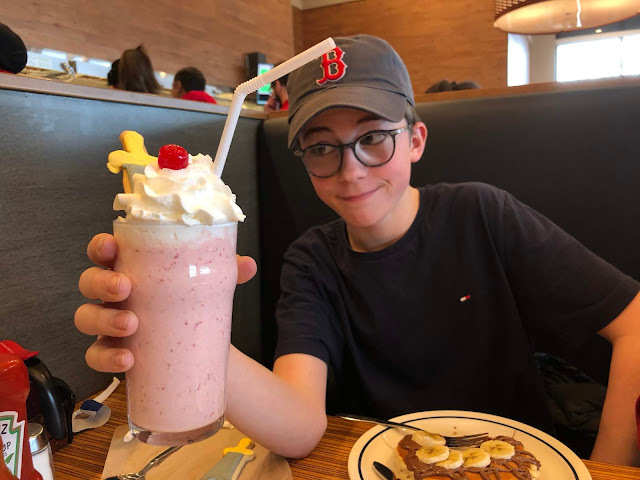 IHOP provided me with the $20 voucher to giveaway to my fabulous readers. Images, milkshake drinking children, spelling mistakes and opinions are my own. They have cheesecake pancakes with strawberries on top that is too good to be a breakfast food. It is as good of a dessert as you will find!!! I like chocolate chip pancakes with peanut butter! I love mine with strawberries, cream and syrup. Can't beat lemon, sugar and a drizzle of golden syrup ! The knack to eating pancakes however it the speed at which you can inhale them ! Get 'em fast before anybody else. Even better, eat somebody else's pancakes.....a stolen pancake tastes much better than your own.....so I've heard ! Blueberries and lots and lots of syrup please! I love any pancake, but the best is the one my ma made for me when I was little, a little bit of hazel nut chocolate and berries mmmmm.